MNML partnered with Mark Cuban-backed startup Radical Transport to re-imagine the future of two-wheeled transport from the ground up. In the wake of flaming hoverboards and widespread consumer distrust, MNML and Radical worked together to create the Radical MOOV, a new breed of two-wheeled personal transport that features customized ride dynamics, is engineered with premium mechanics, and is hand assembled in Dallas, Texas. This is Radical MOOV. MNML got involved early on with Radical Transport to be their partner in designing and engineering Radical's vision for the future of two-wheeled transportation, aiming to leave the tarnished and toy-like reputation of traditional hoverboards in the dust. MNML helped to translate the technology pioneered by Radical into a form factor that is familiar but engineered from the ground up with new technology to be a serious and reliable mode of personal transportation. The MOOV looks different because it is different. With a lower stance, larger wheels and ultra-thin unibody construction, MOOV is a machine, not a toy. MOOV takes a premium approach to form and function. The die-cast aluminum chassis provides structure without compromising weight. The ride platform sits below the center of the axle, bringing the board and the rider closer to the ground for optimum control and stability. The large, impact-absorbing wheel is wider and larger for a smooth ride with tread optimized for both street and indoor surfaces. Inspired by skate and snowboard culture, MOOV’s decks can be customized to suit your unique style. The interchangeable decks are secured with powerful magnets for a fast and painless swap. MOOV responds to your body's natural sense of balance, increasing rider stability and improving handling. 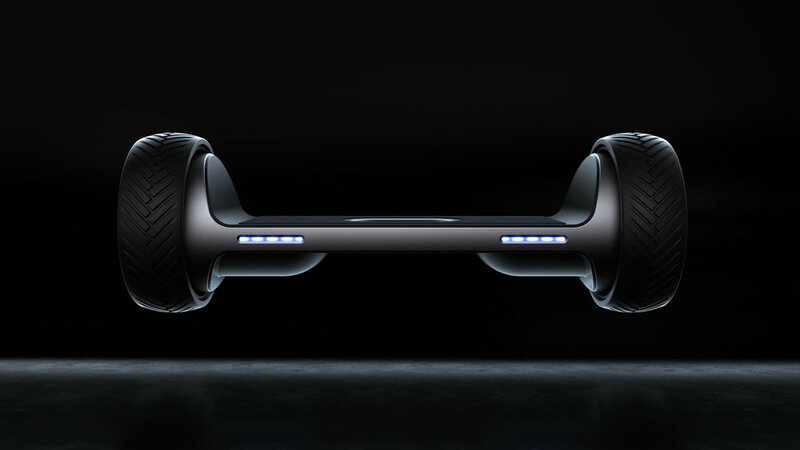 Radical Transport's T2 Technology seamlessly balances the rider the moment you step on board. It responds to changes in foot position and weight transfer for a more refined level of rider input. By strategically utilizing existing components in the board, the MOOV gains more effective rider input without the need for traditional footpad sensors. Knowing when you are ready to roll and where you wish to go should be handled with technology more sophisticated than crude on/off sensors hidden under cheap rubber mats. Your car doesn’t use push buttons for the gas and brake pedals, right? Riders can safely master handling the board before operating at higher speeds. Over the life of the board, the ride continues to suit the rider. Operating as the brain and heart of MOOV, the controller circuit boards monitor the batteries state of charge, reading relative voltages to each other, and actively keeping the packs balanced. Redundant safety checks monitor the battery packs and guarantee safe operation through a dedicated and independent battery management system. It is constantly measuring individual cell voltage, temperature, overall current, and has the ability to shut off the pack if it ever deems the batteries unsafe. These components are critical; which is why Radical secured their production by an American electronics manufacturer known for making small quantity, military-grade circuit boards. Off-the-shelf motors simply aren’t enough to achieve the optimal balance of power and torque. The MOOV features a custom drive system powered by dual 9" 350 watt hub motors and cutting-edge motor control technology to provide responsive and fluid power delivery. MOOV's drive system utilizes both sensored and sensorless torque application to allow for an incredibly smooth riding experience. Using quality batteries was critical in order to gain back consumer trust in the space. Leveraging a UL 1642 certified, safe, efficient lithium ion cell, MOOV delivers performance and efficiency second to none. Dual, custom 6600 mAh, 37 volt Lithium Ion packs gives MOOV 8 hours ride time or 12 miles distance. Fully recharge MOOV in only 2.5 hours, or get back on the road quicker with a 4-mile Fast Charge taking only 30 minutes. To maintain symmetry and allow for a centralized carrying handle, the battery pack is split into a dual pack design. From presets to custom settings, four dynamic ride profiles allow riders to adapt the board to complement desired riding styles. With MOOV’s integrated smartphone app, riders can tailor the ride dynamics to match their preferences, stay informed with battery status and range calculation, and maintain control with the ability to lock/unlock the board. MNML worked closely with Radical Transport from initial sketches through to prototyping and engineering to ensure that the MOOV was designed and built with the highest quality, safety, and craftsmanship in mind. MOOV leverages custom built components to ensure the highest quality ride, from the die cast unibody aluminum frame ensuring both strength and lightness, to the certified Lithium Ion batteries which are cradled safely in an insulated compartment, protecting them from the elements, and dampening terrain vibration. Leveraging our past experience with using Kickstarter as a platform for bringing disruptive products to market, MNML worked with Radical Transport to develop their web presence, branding, visual assets, and campaign materials to run a successful campaign, raising 150% of their target funding.